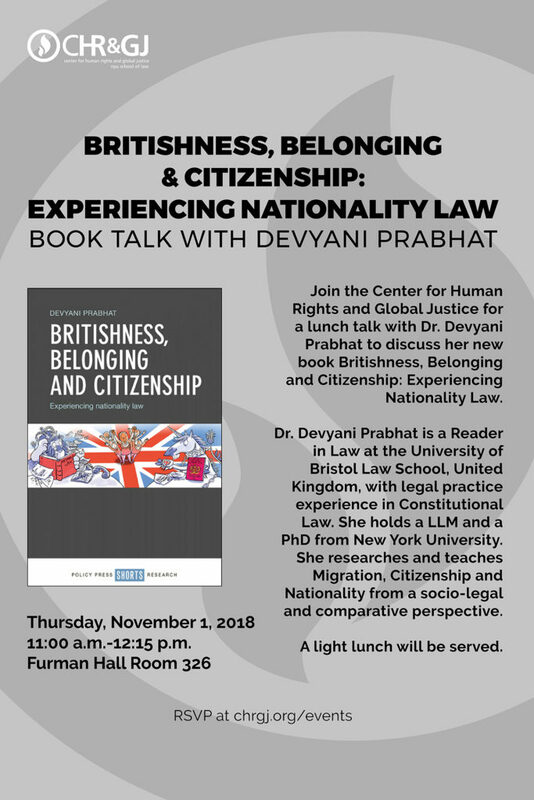 Join the Center for Human Rights and Global Justice for a lunch talk with Dr. Devyani Prabhat to discuss her new book Britishness, Belonging and Citizenship: Experiencing Nationality Law. Dr. Devyani Prabhat is a Reader in Law at the University of Bristol Law School, United Kingdom, with legal practice experience in Constitutional Law. She holds a LLM and a PhD from New York University and is an Attorney at Law, New York. She researches and teaches Migration, Citizenship and Nationality from a socio-legal and comparative perspective. She is an ESRC research grant holder on British Citizenship and the Practice of Nationality laws (2014-2017). Project website: http://www.bristol.ac.uk/law/research/centres-themes/citizenshipandlaw.html. The project focused on the processes of gaining, holding and losing of citizenship and the role of nationality law practice for long term residents or British citizens. She supervises doctoral students researching on citizenship, migration, children’s rights, human rights, the legal profession, and sociolegal theory and methods. Dr. Prabhat’s book Unleashing the Force of Law: Legal Mobilization, National Security, Basic Freedoms ( Palgrave Macmillan Socio-legal Studies Series) has won the Birks Prize for Outstanding Legal Scholarship (Society of Legal Scholars ) 2017. The book was shortlisted by both the Society of Legal Scholars (2017) and the Socio-Legal Studies Association (2016) for book prize awards. Dr. Prabhat works closely with practioners and civil society actors in a number of countries. Currently she is editing a book on British Citizenship (Elgar: forthcoming 2019) which is based on academic-practitioner collaborations in the field of immigration law.